"I have worked with Tatiana on several websites and she has always done a superb job. From start to finish she is reliable, prompt, patient, creative, and easy to work with. She takes your vision, improves on it and gets the job done. Always available for quick updates, reviews, and dumb questions. Her annual maintenance package is a great deal." "Tatiana has been our webmistress for 3 years and has consistently provided excellent service. From the initial design of our non-profit website to our frequent site updates and change requests, she has been prompt, knowledgeable and reliable. Our website is always great looking, professional and easy to navigate." Catherine Gould came up with a new idea to raise awareness and funds to combat poverty in 2008. 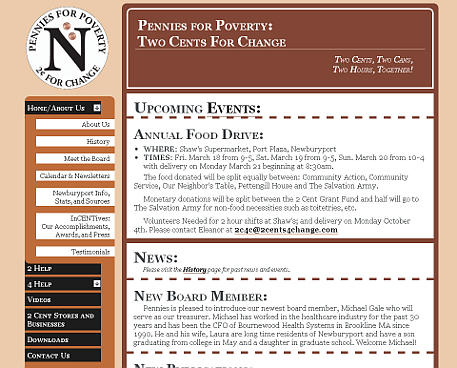 Originally this site was created as a subdomain of the Poverty Program site, and thus shared the same layout. The only difference was the color scheme. In July of 2009, the design was updated. The first change was to center the menu bar and the main text box by creating a main section with a set width. This change, while reducing the width of the main text box for larger browser resolutions, allows for easier viewing by creating more "white-space"; which is important with a site that relies on text, as this one does. The second change was having the menu buttons change color if on that page. This allows for easier navigation, as it makes it easier to identify the current page. In July of 2010, the design was updated a second time. The first major change this time was adding drop-down menus while maintaining active submenus. For example, now when a website user is on the index page, they will still see the submenu underneath the "Home" button, but they will also be able to access the other submenus underneath the 2 Help and 4 Help buttons. The other major change was a re-organizing of the pages on the website to create a more intuitive navigation system.